Hello everyone! I know most of the attention at this site is to FF7 and FF8, but I'd like to share a mod I did for FF3! 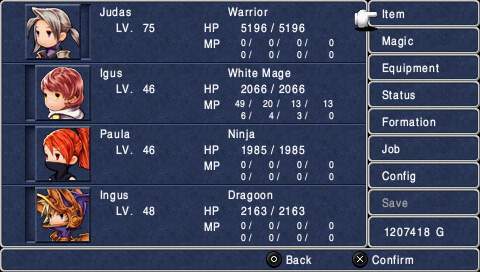 For those of you that don't know, the PC version of FF3 uses the terrible, terrible menus from the mobile release of the game. The menus are cluttered with big touchscreen buttons that don't fit well with a big screen and make things awkward! Anyways, here is a link to the mod! I hope you enjoy. Also, the mod has options for all supported languages: Deutsch, English, Español, Français, and Italiano. 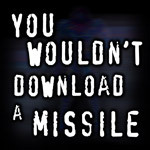 Awesome, this is exactly what Square Enix should have done; thanks a lot! This is such a huge improvement. Nice work, man. Now that is a must of a mod. I had bought the Steam version, to play it when my pc would be build. Now my pc is half build but already running and I'm happy that I'll be able to experience my first playthrough with that cool mod. Thanks for all the nice comments! Really glad people like it. Wow. I'm just now looking at this. Did SquareEnix just port the iOS port? What lazyness! This is much better visually! IcePenguin, the mod for the french version works great but the main menu text (Item, magic...) is not aligned to the left but centered, can you fix it ? Also for the next release, would it possible to show all battle commands at once during encounters ? Okay, I can do that. The reason I centered the other languages is because some of the words get rather lengthly, and would look odd not centered. But if anyone knows the proper abbreviation for the words, that would be awesome! Thanks! Just ask if you need the corret abbreviation for a specific word from the french menu. Awesome job, looking forward for this! I find your character names questionable, at best. Just a random screenshot I took from google. great stuff, usually I use psp emulator to play this game, now with this mod I guess the pc version may be the best. would it take much effort to do the same thing with Final Fantasy IV? I love this mod. You've improved the PC remake tenfold. Thanks alot for your work. Would something like this work for FF4 and FF4: After Years as well? anyway, yeah if this can be done for ffIV, and if there could be a FoV hack for ffIV that would be great as the same is super zoomy. It looks like FFV that is coming out this month, will sadly need the same treatment. 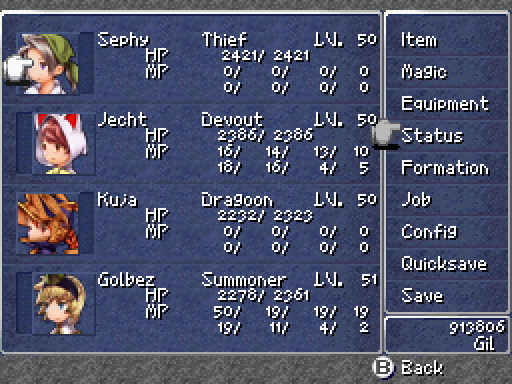 FFIV, FFIV - After Years, and FFV. IcePenguin, you are our only hope! This is beautiful. I just came across this mod on Steam's FF Modding community. You are awesome, Mr. Penguin. Anyway to do this on Final Fantasy IV? This is a very good mod.